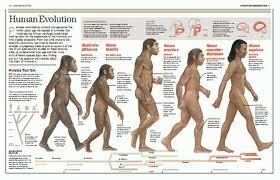 Human evolution refers to the evolutionary process leading up to the appearance of modern humans. While it may begin with thelast common ancestor of all life, it is usually only concerned with the evolutionary history of primates, in particular the genus Homo, and the emergence of Homo sapiens as a distinct species of hominids (or "great apes"). The study of human evolution involves many scientific disciplines, including physical anthropology, primatology, archaeology, linguistics, embryology and genetics. Primate evolution likely began in the late Cretaceous period. According to genetic studies, divergence of primates from other mammals began 85 million years ago and the earliest fossils appear in the Paleocene, around 55 million years ago. The family Hominidae, or Great Apes, diverged from the Hylobatidae family 15 to 20 million years ago, and around 14 million years ago, thePonginae, or orangutans, diverged from the Hominidae family. Bipedalism is the basic adaption of the Hominin line, and the earliest bipedal Hominini is considered to be either Sahelanthropus or Orrorin, with Ardipithecus, a full bipedal, coming somewhat later. Thegorilla and chimpanzee diverged around the same time, and either Sahelanthropus or Orrorin may be our last shared ancestor with them. The early bipedals eventually evolved into the Australopithecines and later the genus Homo. The earliest documented members of the genus Homo are Homo habilis which evolved around 2.3 million years ago. Homo habilis is the first species for which we have positive evidence of use of stone tools. The brains of these early homininas were about the same size as that of a chimpanzee. During the next million years a process of encephalization began, and with the arrival of Homo erectusin the fossil record, cranial capacity had doubled to 850cc. Homo erectus and Homo ergaster were the first of the hominina to leave Africa, and these species spread through Africa, Asia, and Europe between 1.3 to 1.8 million years ago. It is believed that these species were the first to use fire and complex tools. According to the Recent African Ancestry theory, modern humans evolved in Africa possibly from Homo heidelbergensis and migrated out of the continent some 50,000 to 100,000 years ago, replacing local populations of Homo erectus and Homo neanderthalensis.